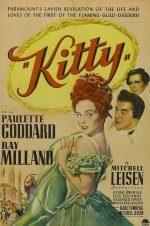 Paulette Goddard is the cockney waif plucked from the streets of 18th-century London to be tutored for marriage into high society in this sumptuously mounted drama. Beautifully acted, well photographed and brilliantly directed (by Mitchell Leisen), this is a harsh variation of Pygmalion with Goddard being forced into two unsuitable marriages. Ray Milland is his dependable self as the nobleman pulling the strings, Constance Collier is a dissipated aunt and Sara Allgood a Hogarthian wreck, but the real scene-stealing is done by Reginald Owen as a lecherous old duke whose death scene is particularly well staged.